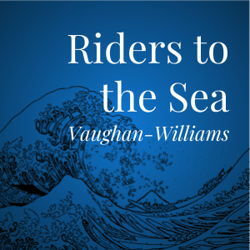 Set on the remote island of Inishmaan, Vaughan-William’s intensely tragic opera is based on J.M. Synge’s play Riders to the Sea. Before the opera starts, Maurya has lost her husband, his father, and five of their sons to the sea. One son is still missing and the family is awaiting news of any remains being washed up on the shore. The priest has given Nora, the younger sister, some clothing which was taken off a drowned man, and asked her to find out if they belong to Michael. She and her sister Cathleen put the things away hurriedly as their mother, Maurya wakes up; they don’t want to worry her. Bartley rushes in making preparations to leave, and his mother begs him not to leave, cursing and scolding him for going. He has to take the horses to the fair, and he cannot miss this boat. At Cathleen’s insistence, Maurya follows him a short while after, with the intention of giving him her blessing instead of leaving him with a ‘dark word’. When she returns she is distraught and almost in a trance. She has seen the ghost of her missing son, Michael, riding on the pony behind Bartley. For Maurya, this is a sign that her last remaining son will be lost to the sea. As she lists the children she has lost to the sea, the sound of keening confirms her vision. Bartley’s body is brought in and Maurya prays for Bartleys soul as a bleak calm settles over her. Vaughan-Williams sets Synge’s play to music with very few changes, capturing the lilting rhythms of the Irish dialect which is woven into Synge’s language. The surging and rushing of the violent sea and the chilling wind can be heard in this thrilling score, and they sweep a listener away onto a tumultuous emotional journey with Maurya, a mother in mourning.